(CN) – Much more work is needed to remove residual carbon dioxide from the atmosphere in order to truly reach United Nations climate change goals, researchers revealed Monday. While the shift to alternative energy like wind and solar power are encouraging steps, fossil fuels are still widespread in industry and transportation and much more effort is required to mitigate their harmful effects, the team found. “Negative emissions are no longer a choice but rather a necessity,” said Gunnar Luderer of the Potsdam Institute for Climate Impact Research, the lead author of the study published Monday in the journal Nature Climate Change. The study looks at carbon emissions from industries like cement and steel, transportation, and the heating of buildings. The researchers weighed their findings against emission targets set by the 2015 Paris accord, where U.N. member states agreed to keep the overall temperature of the planet at between 1.5 and 2 degrees Celsius above pre-industrial levels. That’s the figure the vast majority of scientists say is required to avoid the most catastrophic effects of climate change caused by greenhouse gas emissions. But residual emissions from various industries remain the biggest challenge to meeting those goals, according to the study. “Climate mitigation might be a complex challenge, but it boils down to quite simple math in the end: If the Paris targets are to be met, future CO2 emissions have to be kept within a finite budget,” said Elmar Kriegler from the Potsdam Institute. Using seven different computerized simulations, the researchers found around 1,000 gigatons of carbon dioxide will be in the atmosphere even if all the nations that signed the Paris accord met all their stated contributions. “This seems to be a lower end of what can be achieved with even the most stringent climate policies, because much of the residual emissions are already locked into the system due to existing infrastructures and dependencies on fossil fuels,” said Luderer. The study compared and contrasted models where countries adopted their climate change goals early and models where they took no action to strengthen their U.N. pledges. 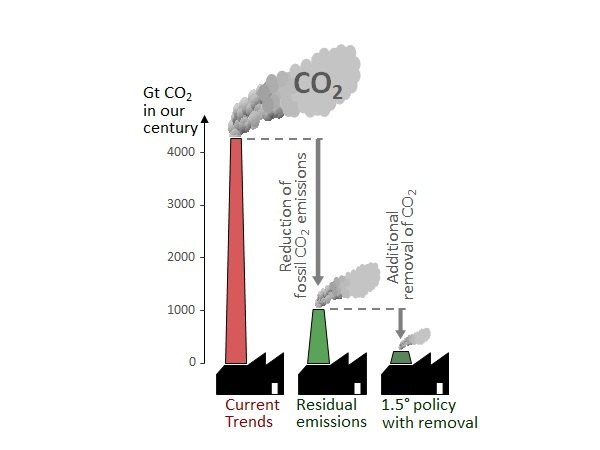 All told, between 640 and 950 gigatons of carbon dioxide need to be removed from the atmosphere to meet the 1.5 degree goal, the study concluded. And if countries don’t strengthen their pledges before 2030, it would hurt the potential for long-term removal of CO2 because even more investments in fossil fuels will be locked in. “In order to achieve the additional fossil fuel reductions required for 1.5 degree Celsius stabilization, we need to accelerate energy efficiency improvements and a widespread electrification of energy demand,” said researcher Zoi Vrontisi from the National Technical University of Athens. Last June, President Donald Trump said the United States would drop out of the Paris accord, claiming the landmark climate-change agreement put the nation “at a permanent disadvantage” and will undermine the economy. Since then, 16 states and Puerto Rico formed the United State Climate Alliance and remain committed to the goals of the Paris accord.